Primary healthcare is a vital strategy which remains the backbone of health service delivery. Primary healthcare is the day-to-day care needed to protect, maintain, or restore our health. For most people, it is both their first point of contact with the healthcare system and their most frequently used health service. In India concept of primary healthcare was laid down by the recommendations of Bhore Committee (1946). In last 6 decades of independence, we have seen much improvement in primary healthcare services, infrastructure, and related healthcare indices of the country. Still many challenges are ahead to achieve health for all. There is a need to review primary healthcare in the country to know our strengths and weaknesses to face the challenges in the future. This review article discusses the evolution of primary healthcare system in India over period of time. It also focuses on the challenge for primary healthcare system in current scenario and in future. A search strategy involved a detailed literature review on the subject of primary healthcare system in India. Indexed and non-indexed journals, websites of important organizations, and national programs in the field were identified and searched for key words. The most relevant publications were reviewed in detail and included in the present review. The World Health Report 2000 (WHR 2000) identified four core functions that all health systems should carry out in some way, regardless of how they are organized or where they are. They were financing, resource generation, service delivery and stewardship. Stewardship according to WHR 2000, is the most important and key function of health system in generating good performance and responsibility of the government, usually done through the Ministry of Health, is defined as "the careful and responsible management of the well-being of the population", emphasizes the trust and legitimacy with which its activities are viewed by the general public. In this review article, library and internet search were used. In order to search the databases - Springer, Pubmed, Elsevier, ISI web of sciences, Scopus and Google scholar have been used. Six domains/sub-functions that collectively are thought to constitute effective health system stewardship are generation of intelligence, formulating strategic policy framework, ensuring tools for implementation powers; incentives; and sanctions, building coalitions/building partnerships, ensuring a fit between policy objectives and organizational structure and culture, ensuring accountability; responsibility and answerability to the population and consumer protection. The assumption is that, collectively, the better these sub-functions are carried out, the more effective health system stewardship will be and the higher attainment of intrinsic goals. Therefore, to perform better in the healthcare system and create the best and fairest health system, effective stewardship must be developed. There are several lessons learned in the field of health and safety. There is a need for more closer and constant correspondence between the end-user country and operators around the world to ensure higher safety standards. Also damage control measures for HIA need to be reviewed. In nutshell Fukushima Daiichi 2011 was an "eye opener" for the entire world in the area of nuclear safety and nuclear disaster management. Background: Critical Incident Reporting System (CIRs) and in a wider scope Patient Safety Reporting Systems (PSRS) are reporting systems that identify operational errors of an organization, analyze root causes of them and recognize priorities and modifiable issues for further investigation. Also, need of resources and management are reflected in organizational challenges. Vital errors and incidents in healthcare require health organizations to have reporting systems. Materials and Methods: This is a descriptive and comparative study. The scope of this study included related reporting systems of selected countries such as the United States, Australia, England, Ireland and Denmark. Data was gathered from systematic internet search, Websites of ministries of health and websites of reporting systems included: DPSD, 'CIS', 'NRLS', ISMP and AIM. Results: Comparative criteria of reporting systems were developed under 12 scopes. These include 3 Infrastructure criteria and 9 process criteria and 4criteria of process criteria which were descriptive and 5 criteria of them were evaluative. Considering infrastructure criteria, most reporting systems are designed voluntarily, reporting internally, with the aim of learning and observing confidentiality at both individual and organizational levels. In terms of process-evaluative criteria in selected reporting systems, adverse event and close calls were often reported through closed multiple choice elements reporting forms received from secondary and tertiary healthcare coverage levels with responsibility of personnel. Prospective data collection is also less applicable in selected reporting systems. 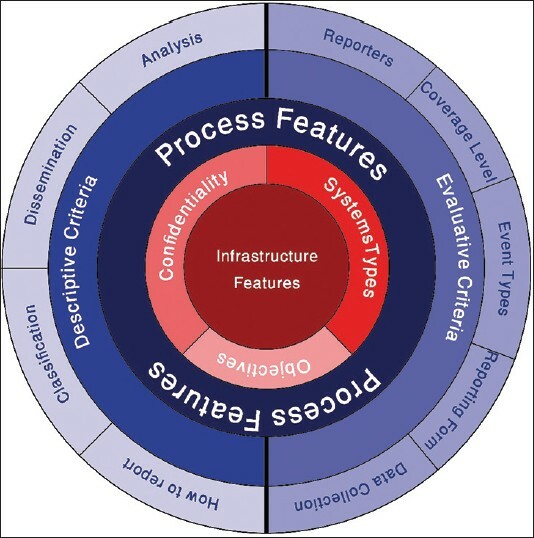 In terms of process-descriptive criteria, reporting is often performed through website, regional/local department, paper and Reports are disseminated and feedback provided to the referral organizations or staffs after classifying and analyzing them through a risk assessment model (like RCA or Systemic approach). Conclusion: Social, political and cultural infrastructure, affect the purpose of a reporting system and the purpose itself determines type, confidentiality, reported events scope and contributory factors of a reporting system. Introduction: Presenting services with high quality in emergency department has its significant due to its specific conditions. Prerequisite of presenting effective health services is to evaluate and compare them with predetermined standards. According to the importance of hospital's emergency in increasing patients' satisfaction and improving clinical services' quality, this survey has been done with aim of analysis the emergency department of Noor and Ali Asghar hospitals according to new format of accreditation standards. Materials and Methods: This survey is a descriptive research which has been done in Noor and Ali Asghar Hospital, in Isfahan and in 2011. The research tool for gathering information is a checklist which has been prepared from the emergency standards of health, therapy, and medical education. Data has been gathered from related documents and corporation of internal, poisoning, and men and women psychiatric emergencies. In order to data analyzing, Statistical Package for Social Sciences (SPSS) and Excel software have been used and the state of hospital's emergencies compared with each other. Findings: The finding of the present research shows that in management and organizing part with maximum grade of 34, the maximum point belongs to internal emergency department (26 point); in human power management with maximum point of 244, the maximum point belongs to internal emergency department (145 point); in equipment and supplies with maximum point of 78, the maximum point belongs to poisoning emergency department (66 point); in security, quality improvement, and data gathering with maximum point of 390, belongs to poisoning emergency department (252 point) and internal emergency department (250 point), and women and men psychiatric emergency department (242 point) achieved the most highest scores. Discussion and Conclusion: The results show that because of the ease of poisoning emergency availability to paraclinic's services, the highest point is related to this part. The cause of the significance difference in management and manpower management is related to the lack of policy and method of working in emergency departments. So forming the meetings and holding educational courses with the processes' owners are very useful in policy and methods making. Introduction: Realization of such causes on the mortality data is very critical and can aid at informed decision making and at devising evidence based definite and timely intervention strategies. The paper attempts to review the existing systems that report causes of death in India. To assess the quality of existing reporting systems on causes of death in India in terms of methodology followed, coverage, completeness, reliability, and pattern of cause of deaths. Materials and Methods: The study design followed was a cross-sectional exploratory one. Secondary data available under Medical Certification of Cause of Death (MCCD) 2007, Report on Cause of Death (RCD) 2001-2003, Global Burden of Disease (GBD) 2004 (updated 2008), and Sample Registration System (SRS) 2008 were reviewed to assess the quality of existing reporting systems on causes of death in India in terms of methodology followed, coverage, completeness, reliability, and pattern of cause of deaths. A correlation analysis was also done to understand the similarity between the reports. The data was analysed using Excel and Statistical Package for Social Sciences (SPSS) version 20. Results: Wide discrepancies observed between the existing reporting systems on cause of death in India. RCD was found to be more appropriate in terms of coverage, completeness, quality check, reliability, and representative character. RCD 2001-03 also showed high correlation with MCCD 2007 and GBD 2007. Conclusion: Having multiple reporting systems with the same objective could pose unnecessary duplication of efforts and wastage of various resources. Having observed discrepancies in the reporting systems, it is emphasized that the existing systems are reorganized/collated to provide quality, accurate, and uniform data on cause of death. Context: Since the accident, including the most common causes of death and disability in the world is the impact of stress on various aspects of economic, social, comfort and safety, and public welfare. Aims: Factors affecting their economic, social, and health services following disasters can benefit from the provision of basic guidelines that may help to reduce the impact of disasters. Settings and Design: This study is descriptive and analytical that has been done sectionally in 2012. 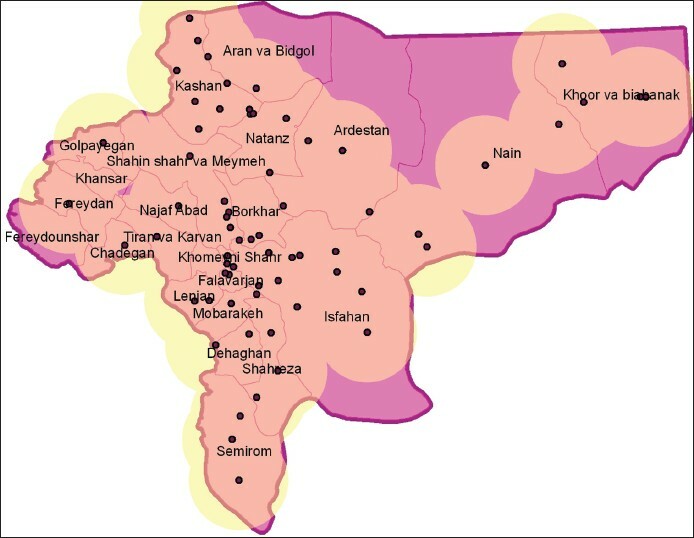 Materials and Methods: The study population was all households in Isfahan. Number of sample households is 1037 which was estimated using random cluster sampling. The questionnaire collected data were entered into the Statistical Package for Social Sciences (SPSS) software 16. Statistical Analysis Used: Household economic cluster was calculated by factor analysis method. Pearson correlation and ANOVA was used to determine the influence of socioeconomic status on health utilization and disease distribution. Results: Number of outpatient health service utilization during accidents has been affected by economic factors such as households with higher education, higher income, and greater coverage of these services (P < 0.05). However, the use of inpatient health services and costs was not under the influence by any components of socioeconomic factors. Conclusions: Socioeconomic inequalities in the incidence of accidents and utilization of health services during accidents are exact reflection of inequality in other society parts that this problem has negative influence on all the countries and health section. Background: Medical tourism occurs when a person decides to travel for treatment between international borders. People in the past traveled to developed countries. In recent years, medical tourism has changed in the developed countries. Materials and Methods: As regards to the medical tourism studied and website and structure of provision of health services in our country, the below structure can be suggested for enjoyment of university professors in the provision of service of medical tourism as well as for good interaction with tourism organization and ministry of foreign affairs. Result: Today, medical tourism is a developing industry in the world, that allocates great turnover to self. Iran has potential to optimize the use of this chance. It is necessary for developing medical tourism to use the information system-based web for introducing the services and communication between service provider and customer and in order to ensure that the system has maximum efficiency that is involved among the different organizations. In this article, we have provided the logical data structure. Conclusion: Certainly one of the ways to achieve the goals of medical tourism and its economic benefits, facilitate easy and efficient communication strategies that lead to customers (tourists) and managers and service providers to be. Thus one of the important tasks is to create a web-based information systems which require suitable modeling and architecture. Context: Candidemia is a major cause of nosocomial morbidity and mortality in neonates. Although Candida albicans remains the most common fungal isolate from blood, longitudinal studies have detected a trend toward an increased prevalence of other Candida species. Aims: To study the changing pattern of candida species and their importance in bloodstream infection in neonates. Settings and Design: This is the 3-year respective study. Subjects and Methods: The neonates born or admitted during Jan 2010-Dec 2012 were included in the study. A total of 69 neonates with Candidemia as evidenced by positive blood cultures were considered. Peripheral blood samples were collected for culture, isolation and identification of Candida species by bacT/alert automated system, germ tube test and Vitek 2 cards for yeast identification. All the isolates were checked for purity and speciated by Chromagar. Statistical Analysis Used: No. Results: A total of 7.48% neonates had Candidemia. Non-albicans Candida was found in 85.5% of neonates while Candida albicans was found in only 14.5% neonates. 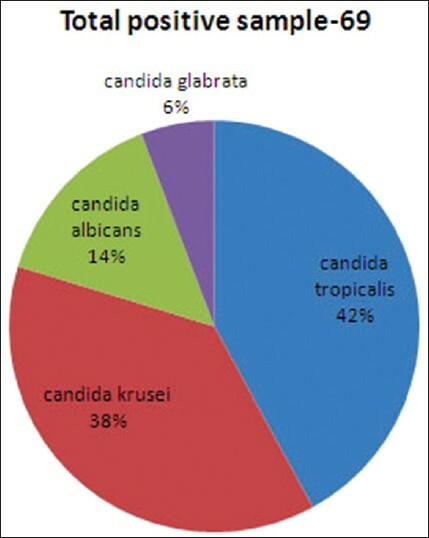 Candida tropicalis (42%) was the predominant non-albicans Candida species isolated in our setting followed by Candida krusei (38%). Conclusion: There are multiple risk factors that are responsible for emergence of neonatal Candidemia in recent years. In conclusion, non-albicans Candida species are assuming an increasing role in nosocomial infections in neonates and finding of this study highlights the increased isolation of Candida tropicalis in our setting. The study emphasizes the identification of candida species to reduce morbidity and mortalities in the neonates. Context: The most widely and classically used measures in tobacco dependence assessment is The Fagerström Test for Nicotine Dependence (FTND). There are few articles studying the factors associated with Fagerström test among Iranian smokers. Our aim in this study is the determination of the association between sociodemographic factors and FTND test. 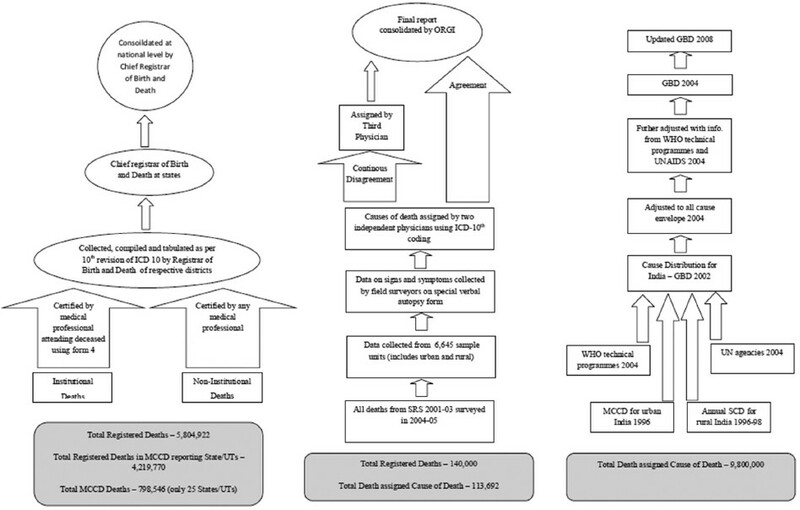 Materials and Methods: This cross-sectional study including 673 subjects was obtained from people who were referred to the health center for smoking cessation. The questionnaire included items on sociodemographic information and information on smoking cigarettes and history of cessation. Result: Mean ± SD of age and age of onset smoking were 39.7 ± 1.1 and 18.6 ± 5.5, respectively. Mean ± SD with scale ranging from consuming number of cigarettes per day and FTND of smokers, were 22.1 ± 11.5 with 2-90 and 7.4 ± 0.81 with 4-9, respectively. Association of demographic and some other characteristics with Fagerstrom status for Nicotine Dependence were studied in the smoking participants. The ORs [95% CI] were as follows: In primary education level 2.2 [1.1-4.9]; number of smoking per day 1.3 [1.2-1.4]; duration of smoking between 10-19, 20-29, and more than 30 years 2.5 [1.1-5.6], 2.2 [0.93-5.2], and 4.3 [1.7-10.7], respectively; without history of previous quit attempt 2.1 [1.1-4.1]; nicotine concentration more than 0.8 mg/pack 4.8 [2.7-8.4]; enjoying in routine activities 2.9 [1.3-6.2]. Conclusion: The above results suggest that there are significant associations between Fagerstrφm status and smokingrelated behaviors in the Iranian population, consistent with previous reports worldwide. These factors should be considered to have appropriate public health and policy response. Introduction: Nowadays patient safety is one of the biggest concerns that health care organizations are faced with and medication errors is the most common cause of patient safety threatening. Low access to information during the decision-making and poor communication between care team members are the leading cause of medical errors that appear in most handheld systems. Therefore, this study investigated the knowledge of Physicians, nurses and pharmacy personnel about CPOE in Ayatollah Kashani Academic hospital in Isfahan, Iran to improve patient safety. Materials and Methods: This is a descriptive cross-sectional study in which 213 physicians', nurses' and pharmacy personnel's knowledge was surveyed by the questionnaire with 76 items. In Ayatollah Kashani hospital, we measured the knowledge of all 58 physicians and 10 pharmacy personnel about CPOE, but we sampled nurses by Morgan table and the 95% confidence level (144 nurses). Obtained data were analyzed with Statistical Package for the Social Sciences software (SPSS 16) and descriptive statistics were used to examine measures of compliance. Results: The findings indicated that knowledge of physicians, nurses and pharmacy personnel about CPOE was relatively desirable (65%). Their knowledge about the CPOE roles in medical prescription, dispensing, administration, time required in providing care, productivity, patient safety, and costs were 69%, 58%, 69%, 62%, 69%, 77% and 64%, respectively. Conclusion: Knowledge of physicians, nurses and pharmacy staff about CPOE was desirable; therefore, to improve the present situation, education, investment and infrastructure provision are necessary. Introduction: Human are constantly exposed to natural and non-natural disasters and when facing such problems, always try to seek a way out. In such situations, he/she would be in need of help from others particularly from rescue organizations such as emergency services. Thus, to provide such services in time, spatial distribution of facilities is of great importance. 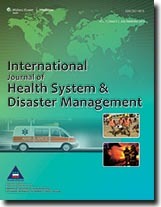 The spatial distribution of emergency medical services (EMS) units in Isfahan province would be studied in this article. Materials and Methods: This is a case report which describes the distribution of physical and human resources of prehospital emergency care bases. Based on available documents, the number of mentioned resources in different cities of the province was surveyed and then, using Google Earth and Geographic Information System (GIS) software, the density and coverage of the constructed facilities were shown. Results: The density and coverage of EMS units in the western province are more and in the eastern and northern parts including Khoor va biabanak, Nain, Ardestan, and Aran va Bidgol, the coverage is less due to vastity. Conclusion: Based on the results, allocation of resources in different cities of Isfahan province has great differences. Actually, the need to the resources must be determined and the emergency needs must be answered by equitable distribution of resources before entering the hospital in order to prevent further harms and costs. Background: Medical errors are often described as human errors in healthcare. A medical error occurs when an inappropriate method of care or improper execution of an appropriate method of care happens. In fact, medical error is a preventable adverse effect in medical sciences practice, which is evident and harmful to the patient. Aims: To elucidate areas of medical errors; so as to understand, where medical fraternity has to become careful in medical practice via review of literature. Settings and Design: All kinds of study designs and examples from both developed as well as developing countries on medical errors were taken. Statistical analysis used: Review manager software was used to identify studies without any statistical test. Materials and Methods: A review of literature of last 10 years up to 20 th Nov 2013 was done in all forms including e-journals on key search word: "Medical errors in practice" with inclusion criteria of impact of medical errors globally on patients from all kinds of study designs from developed or developing world excluding thesis or dissertation data. Results and Conclusion: The umbrella of medical error includes wide areas such as an inaccurate or incomplete diagnosis or treatment of a disease, injury, syndrome, behavior, infection, etc., The usual approach to correct such errors is; to create new rules with additional checklists in clinical side and following newer models for improvement in medical care such as total quality management, which can identify areas for preventing medical errors and this can be further researched in future studies.